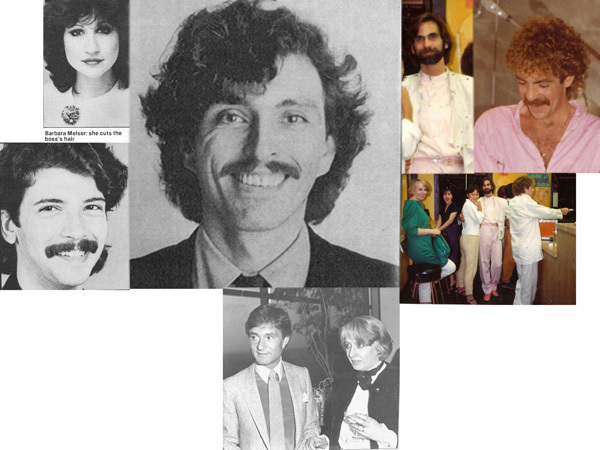 Graham Wren, International Artistic Director, was the senior hairdresser in the New York Salon, with all the expertise to make everything happen. He did most of the hair for Soft Cubism, HighHair, The P-P-Puff. We worked well together; he was gentle and a pleasure. And he had great fashion connections for our photos! Avram had a degree in Fine Arts from the School of the Museum of Fine Arts in Boston, and he used this to help make the photos and hair shows even more outstanding. No one worked more hours than Avram. His hair accessories and props can be seen in all our campaigns. We were a team, Graham, Avram and I, and we each contributed in different ways, each highly important. Avram left the hair world to become an artist, graphic designer, writer and very political. Edward Moore, colorist/texture with a degree in painting. He was very unassuming, innovative,and even came up with airbrush coloring for the first time. Like Graham and Avram, he gave his time generously on PR promotions, which helped bring in new clients to all the salons, something too few understood. Group photo of Helen with Artistic Directors in L.A. for a Board Meeting. Left to right, Helen, Feary Bina, Miwa and Avram, Edward Moore. Photo by Helen Chudoba. Vidal Sassoon with Helen in Toronto, 1981, at the launch of Vidal Sassoon products (and jeans!) in Canada. Tom Principe, Artistic Director, NY. He did one of the HighHair photos, also worked with us on a hair show in front of 2,000 people in Barcelona. As did Damien Miano. Barbara Melser, Barber Shop Director, also had a degree in art from Boston University; she worked only on men’s hair and did the man’s hair for The Queue.